Concrete placement is an important process in the construction that determine the success of the structure and its life. Technical and environmental conditions are taken into strict consideration while placing the concrete. The concrete is allowed to pass through different phase from the point it come out of the mixer till it complete as a finished concrete. The concrete is transported, poured, vibrated, matured, form removed and cured. Each of these phases must follow techniques that will come under good construction practice. Here we will discuss the special considerations and procedures followed to achieve good concrete placement. Before any concrete is placed the entire placing, programme consisting of equipment, layout, proposed procedures and methods is planned and no concrete is placed until formwork is inspected and found suitable for placement. Equipment for conveying concrete should be of such size and design as to ensure a practically continuous flow of concrete during depositing without segregation of materials considering the size of the job and placement location. Concrete is placed in its final position before the cement reaches its initial set and concrete is compacted in its final position within 30 minutes of leaving the mixer and once compacted it should not be disturbed. In all cases the concrete is deposited as nearly as practicable directly in its final position and should not be re-handled or caused to flow in a manner which may cause segregation, loss of materials, displacement of reinforcement, shuttering or embedded inserts or impair its strength. The formwork must be rigid so that it does not get deformed under the pressure of placement of fresh concrete and water tight so the concrete does not leak out. For every new use of formwork, the surfaces have to cleaned and brushed. The concrete reinforcement must be held properly in the formwork. Special care is taken where concrete is dropped from a height especially if reinforcement is in the way particularly in columns and thin walls. Concrete should be placed in the shuttering by shovels or other methods and should not be dropped from a height more than one metre or handled in a manner which will cause segregation. It is recommended to maintain the rate of concreting as constant as possible. Concrete placed in restricted forms by borrows, buggies, cars, sort chutes or hand shoveling should be subjected to the requirement for vertical delivery of limited height to avoid segregation and should be deposited as nearly as practicable in it’s final position. For locations where, direct placement is not possible and in narrow forms suitable drop and Elephant Trunks to confine the movement of concrete is provided. 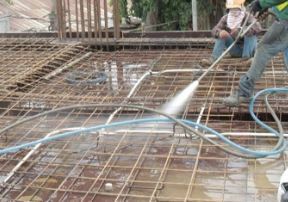 For hot or cold weather concreting the temperature of the concrete must be kept accordingly to undergo effective placement. 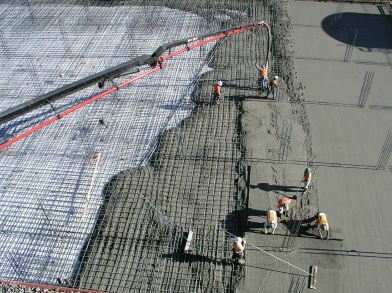 So that the concrete does not dry out or freeze out before completing the placement and related procedures. Concreting once started should be continuous until the pour is completed. Concrete should be placed in successive horizontal layers of uniform thickness ranging from 150 mm to 900 mm. The thickness of each layer should be such that it can be deposited before the previous layer has stiffened. 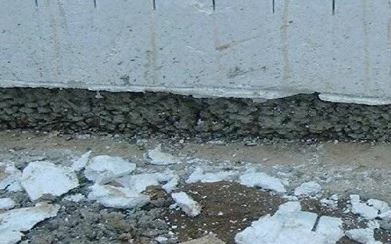 Before placing the next concrete layer, it is necessary to properly compact the below layer. Every underlying layer will be responsive to the vibrations above. These layers hence will Knits together. Concrete placement has to be done rapidly as practicable to prevent the formation of cold joints or planes of weakness between each succeeding layer within the pour. Cold joints are prominent in large pouring sessions. These types of pouring will require proper planning. The bucket loads or other units of deposit should be spotted progressively along the face of the layer with such overlap as will facilitate spreading the layer to uniform depth and texture with a minimum of shovelling. Any tendency to segregation should be corrected by shovelling stones into mortar rather than mortar onto stones. Such a condition should be corrected by redesign of mix or other suitable means. The top surface of each pour and bedding planes should be approximately horizontal unless otherwise specified in drawings.